Pyramid is the sequel to Pharaoh and so do be warned there is a little about Pharaoh in the review below. Pyramid would do well as a standalone novel but I would certainly recommend that you enjoy Pharaoh first. Marine archaeologist and adventurer Jack Howard, together with his friend and diving partner Costas, makes an extraordinary discovery in the depths of the Red Sea – a find that puts under the brightest spotlight one of the key events of the Old Testament. But this is not a good time to be in Egypt. Religious extremists are on the verge of taking over the country, throwing it back into another Dark Ages, taking its people and archaeological treasures to the brink of suppression, death and extermination. It was these dangerous conditions that caused Jack and Costas to flee Egypt in the previous novel, Pharaoh, but their discoveries then were more than enough to bring them back and now, in the Red Sea and in the sands below the pyramids of Giza, there are wonders even more spectacular waiting to be found. That’s if Jack and Costas survive, of course, and the chances of that lessen with every passing hour. Pharaoh was easily one of my top reads of 2013 – a stunning combination of archaeological puzzle and historical adventure, spending much of its pages exploring the Nile through the eyes of sharpshooter Mayne, a British soldier who, back in the 1880s, was given the perilous mission of rescuing General Gordon from the Mahdi, the religious zealot of his day. Relatively little of the book was spent in the present day with Jack and Costas. In Pyramid, though, the emphasis is very much on the here and now as Jack and Costas uncover the clues that they hope will lead them to the source of a great mystery from ancient Egypt’s past – a mystery that would have enormous significance for the Middle East and for the entire world. The time of Gordon and Mayne isn’t forgotten, though. Several of the clues date from this time, in particular a soldier who disappeared into ancient forgotten tunnels, only to emerge months later completely traumatised and with a story to tell. 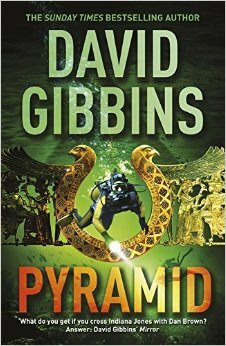 Pyramid is a fast moving archaeological adventure although as with David Gibbins’ other novels and especially Pharaoh, I would hesitate to use the word ‘thriller’ to describe them. There are none of the baddies you’d expect in a conventional mystery thriller. Instead the excitement and danger here come from the dives themselves, from the unknown and from the very real and imminent threat of political and military coup. This is all the more frightening in Pyramid because it is so topical. Few readers can be under any illusion about the significance of this threat and as archaeologists scramble to leave the country, trying to take whoever they can with them, the novel moves into a very dark and disturbing place. Part of the story also takes place in Israel. There is an overwhelming sense that history is being made at the same time that it is being discovered. The archaeological mystery is a good one and the dives are exciting and extremely well described. David Gibbins is an expert and his knowledge shines through, both with the diving scenes and with the history. This meticulousness, in tandem with the absolute charm and appeal of the characters of Jack and Costas, is, I think, one of the main reasons why I enjoy all of these novels so much. Time is taken to get facts straight. If there is one drawback it’s the many times in which Jack and other experts start describing in enormous detail historical events, people, artefacts, places and so on, putting much of the context in characters’ mouths. This can take some getting used to, particularly when such exposition takes place at times of great peril – hardly the best of times for a lecture. Nevertheless, this has never spoiled my pleasure in these novels. It’s difficult to take offence at Jack Howard. More difficult to overcome in Pyramid are the instances of coincidence or convenience. So much is tied together, everything is linked. But this is an archaeological adventure. Allowances must be made for drama. Arguably, it only stands out because of the authority of David Gibbins as archaeologist and author, making it seem the more surprising. But it’s this expertise, enthusiasm and extraordinary detail and care that helps to make these novels distinct from other mystery thrillers – David Gibbins writes about a world that fascinates him, that he knows a lot about, and he pulls me into it. I thoroughly enjoyed the parallel late 19th-century story in Pharaoh, so much so that I missed it in Pyramid, but Pyramid is a fine archaeological mystery by one of my very favourite authors. I love the Jack Howard adventures – long may they continue. This entry was posted in Review, Thriller and tagged Egypt, Thriller on October 29, 2014 by Kate (For Winter Nights).